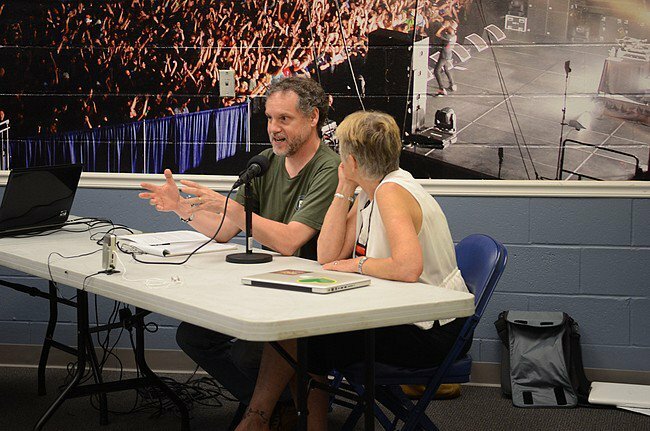 At the recent Friends General Conference, two Quakers active in the Transition movement gave an hour-long interview with Northern Spirit Radio‘s Mark Helpsmeet. This interview focuses on the what and why of Ruah Swnnerfelt’s (Burlington Friends Meeting) and Steve Chase’s (Putney Friends Meeting) local organizing work to create more resilient communities in the face of the challenges of peak oil, climate change, and a dysfunctional global economy. It also explores how they see this community organizing work being related to the social testimonies of their Quaker faith. Ruah, the former director of Quaker Earthcare Witness, is active in the Transition Charlotte initiative and Steve, the director of Antioch University’s environmental studies master’s program in Advocacy for Social Justice and Sustainability, is active in the Keene Transition movement. Steve is also the recent author of the Quaker Press book Letters To A Fellow Seeker: A Short Introduction To The Quaker Way. People can listen to the interview here. Feel free to forward the link to the interview to friends and contacts, and please encourage them to post comments about the radio show on the web site. This will have the effect of increasing the rating of the show in terms of favorites, helping to maintain its visibility on the site as time goes on, and offer interesting food for thought for other people who might consider listening to the hour-long program. Steve and Ruah are also the coordinators of the online Quakers in Transition project of the Earthcare Ministries Committee of the New England Yearly Meeting of Friends. Enjoy this in-depth interview on links between Transition, faith, and action.